Choosing an engagement ring can feel like a mighty responsibility. With so many factors to consider about the diamond alone, it can be easy to forget that personality and style also play a big role in the ring-buying process. In fact, sometimes our clients arrive for their first consultation feeling so focused on finding the perfect diamond that they haven’t yet thought about what setting styles they want to explore. Other times, first-time visitors are so overcome with nerves and pressure that they forget to have fun. And don’t get us wrong – we get it! Engagement rings are expensive and proposals are nerve-racking. That’s why we’ve make it our job to ease anxieties, eliminate uncertainties, and minimize costs wherever we can. Last but not least, we work to make it fun! So, while we are completely committed to teaching you all you need to know about diamonds and GIA grading, it is equally as important to us that we help you pick the perfect setting. After all, the setting is what will make your ring truly unique and special. So today, with that goal in mind, we are excited to introduce our ultimate engagement ring style guide. 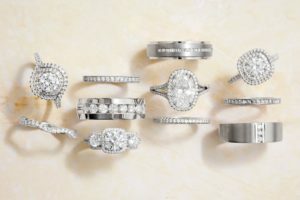 Our team of experts here at Freedman Jewelers sorted through their favorite and most popular diamond rings and have thoughtfully paired them with a handful of personality types that fit them best -- from the most traditional to the most unique. So begin thinking about your future bride and use this guide to determine what setting style will make her as ecstatic about her ring as she will be about her marriage to you! This bride has always been a loyal and dedicated family-girl. She’s been dreaming of the moment her dad will walk her down the aisle for as long as she can remember, and now she’s found the man who will be waiting for her at the end of it: you. She appreciates the little things in life, like long walks on the beach with her dog or dancing in the kitchen while she makes her favorite meal. She prefers to be cozy and is effortlessly beautiful in just jeans and a flannel. But when she’s dressed to the nines, she naturally catches the eye of all who surround her, without needing more than a hint of makeup and a little extra sparkle. And while more simplistic than overstated in her style, she is a classic beauty who exudes timeless grace... and her traditional personality is one of the things you love about her most. Does this sound like your future fiancée? If so, we recommend a simple, classic, solitaire engagement ring. A timeless choice, the solitaire ring will never go out of style. And much like your bride-to-be, the solitaire is simplistic in design and traditional in style, but impeccably beautiful all the same. With a single, sparkling diamond set in a simple band, a solitaire ring catches light and eyes with ease, offering no distractions. Just simple, flawless, beauty. Beyond its obvious aesthetic appeal, the solitaire style seems to genuinely honor and celebrate the commitment of marriage and the precious importance of a traditional wedding as it was originally intended to be. And for the traditional bride, this ring will be a reflection of all her wedding dreams come true. To add a touch of refinement, and even further enhance the diamond’s display (or to keep it lower and ensure its more protected) consider the more contemporary spin on the solitaire with a trellis or basket setting for your ring (see left). If you're hoping for a special and unique ring without losing the traditional feel, you should consider choosing or creating a setting that features “peekaboo” diamonds. These are stones set in the gallery or the undercarriage of the ring -- not visible from when looking at the ring from the top. For the traditional bride who loves a little extra sparkle for the most special things in life, consider a solitaire ring set on a thin band of diamonds. You won’t lose the timeless style or create too much distraction from the center stone, but a diamond band is a simple way to give her that extra sparkle she loves. Not seeing anything you love yet? Why not give her a traditional ring with a twist? Literally. This bride is the definition of elegance, always carrying herself with grace and style. She looks beautiful all the time, but typically chooses to shine in something classic and put together. Whether a little black dress, a stunning gown, or a pair of jeans and a tee, she is timeless. Confident but not showy, kind but not necessarily always out-going, this bride doesn’t seek being the center of attention. But it often finds her anyway. She appreciates romance and luxury, but can also be comfortable without it. It’s more of an air about her than it is a need for expensive things. Whether drinking fine wine over a candlelit dinner or eating her favorite pizza from the couch, she dazzles. Does this sound like your bride? If so, nothing says elegance like pave diamonds. Whether you choose them to line her band, surround her diamond, or subtly pop up in just a few places, pave diamonds drips with elegance. And just like your timeless bride, they never go out of style. This bride is the life of the party. Laughter seems to follow her wherever she goes, and she brings people together with her bubbly and confident personality. She celebrates her friends as often as she celebrates herself, and isn’t afraid to show off just a little. She makes everything look stylish, and while she isn’t necessarily an artist or an edgy individualist, she naturally stands out of a crowd. She’s upfront about what she likes and what she doesn’t, and loves who she loves with her whole heart. Sound like your bride? Whether she is a firecracker, a powerhouse, or a ray of sunshine, the chances are she dreams about a ring that has as much personality as she does. So give her a sparkling conversation starter with a halo setting to show off her diamond. A halo surrounds the center stone with diamonds and often lifts it up higher off the band, often making it appear bigger than it actually is. And surrounding one diamond with a row other diamonds often enhances the sparkle, too. So your bride will love how it catches the light and the eyes of all its admirers. Halo settings come in all different shapes and sizes, so you’re bound to find the one that is just perfect match for her. For those on a tight budget, a double halo (two rows of diamonds surrounding the center stone) is a great way to give an engagement ring some extra dazzle without breaking the bank. Want to make an extra statement? Consider a split shank setting! A show-stopping look, a split shank looks beautiful whether smooth and polished or lined with diamonds. The best part? This style is fun, unique, and not as common as a solitaire or three-stone setting...but it has slowly become more of a trend over the last few years - making it perfect for the bride who wants something special but not too contemporary or unusual. This bride loves nature, wildlife and all things outside. Whether it be hikes in the mountain, bird watching on the river, sunsets at the beach, or planting in botanical gardens, she loves be connected with nature. Maybe she’s add touches of greenery to her home and loves art that celebrates trees and water. Or perhaps she believes in the importance of living organically respecting planet earth. Or, maybe, she’s a girl who leaves her heart on the athletic field and sports her favorite jersey on Sundays, but she still loves to be active in the outdoors and like many other women, can’t get enough of an adorable puppy. No matter when, where, or how she loves to be one with nature, chances are this bride will also love the gift of a diamond engagement ring. So, when asking for her hand in marriage, why not consider blending her passion for nature with the style of her ring? You wouldn’t believe how many designs incorporate beautiful, organic-inspired elements like twisting vines, detailed leaves, and floral patterns. If you have a vision in mind for a nature-inspired ring unlike any other that will match the one-of-a-kind personality of future betrothed, perhaps you’d like to consider a custom designed ring. We’d be happy to help you turn your dream ring into a reality. This bride is a self-proclaimed hopeless romantic. She loves a good love story, from the tales of Romeo and Juliet, to the chick-flick she made you watch last night, to the seemingly endless phone calls she’s shared with her closest friends who have found their prince charming. And now it’s her turn. She’s been dreaming of a fairytale wedding and likely a fairytale ring, one that will complement her fairytale love for you! Sound like your bride? Popping the question with a vintage-style engagement ring may just make her fall head over heels in love with you all over again. Just like the intimate intricacies of romance, the best romantic rings are ones that feature special and unique elements that reflect the unique nature of your relationship. Most brides love sparkle, but romantic brides melt over sparkle that exists in vintage-inspired settings. So look for rings with dainty and unique details, such as milgrain, filigree or scrollwork patterns. Intricate design work and delicate bands also add a feel of true romance. The other beauty of vintage is that the options are endless. If your lady tends to truly get lost in decades passed, and cherishes old world life and love...you might want to see if there is an heirloom ring in the family that could be passed down. She might also love the authentically vintage feel of an estate ring. Knowing there’s a love story already in its past, being passed down from one generation to another can make an engagement ring feel especially romantic. So see if your jeweler has any antique pieces you can peek at. If you’re at all interested in custom design, talk to your jeweler about creating a vintage-style ring that is one-of-a-kind. The custom process is not nearly as intimidating as it might seem, and there is nothing more romantic than knowing each and every detail were thoughtfully designed and specifically created just for your one true love. This bride is always up on the latest trends, but she isn’t always conforming to them. She’s a brave and modern woman, always impressing you with her intellect, beauty, and independent drive. Style-wise, she always looks sharp, but isn’t afraid to try new things and go against the norm sometimes...or all the time. A gorgeous heart with a contemporary edge, she is a glowing reflection of just how strong, creative, and successful women of this century can be. She looks forward to a lifelong marriage in her future, but her wedding dreams will surpass the traditional norms. She’ll be looking for creative ways to make it her own, maybe even leaving some traditions in the past. And the same applies to her future ring. She may not have an exact vision in mind, but she’ll definitely want it to be more modern and contemporary, a compliment to her style and her zest for this ever-changing, modern day world. Does this sound like your bride? If so, we recommend leaving traditions at the door and looking at contemporary ring options. If she’s more daring in her style and loves a truly forward look, you may want to just jump right out of the box and consider a free form ring. Not conforming to any particular structure or shape, these rings are perfect for a truly modern and edgy bride. Or, maybe, shapes and angles and edges are her thing. And rather than confining to the traditional round or square molds, she’d love something more sharp and bold...much like the daring attire she dons every day - that effortlessly cool style you fell in love with from the beginning. For the bride who is equally as modern but perhaps prefers elegant over bold when it comes to her style, who loves all things new, fresh, trending...For her, we’d suggest browsing some of our sculptural-inspired or bezel set rings. These rings put also put a contemporary spin on the traditional engagement ring, without losing sight of the original, significance of the diamond. Perhaps you want to forgo a center stone altogether, which can also save on cost, and consider a wide ring band with beautiful detail instead of one main diamond. Another option is to add colored gemstone accents which will truly stand out from the crowd or use a combination of metals. See anything you love yet? If so, give us a call and come in for a visit. We have all of these rings available here at Freedman Jewelers in Boston, along with hundreds of other styles to choose from as well. Keep in mind that this guide only covers a handful of personalities types and complementing styles. So if none of them sound like your bride, or you don't see anything you like, that's perfectly okay. You can browse more rings here or contact us and we'll help you find exactly what you're looking for. Remember: A diamond engagement ring is a symbol of your eternal commitment to the love of your life. It is also a piece of jewelry she’ll wear every day for the rest of her life. So while color, clarity, and cut all do matter, and budget may be your number one priority ... be sure you allow your bride-to-be and her style be your second. Her engagement ring that will be an extension of her special personality, and therefore, of your love for her.